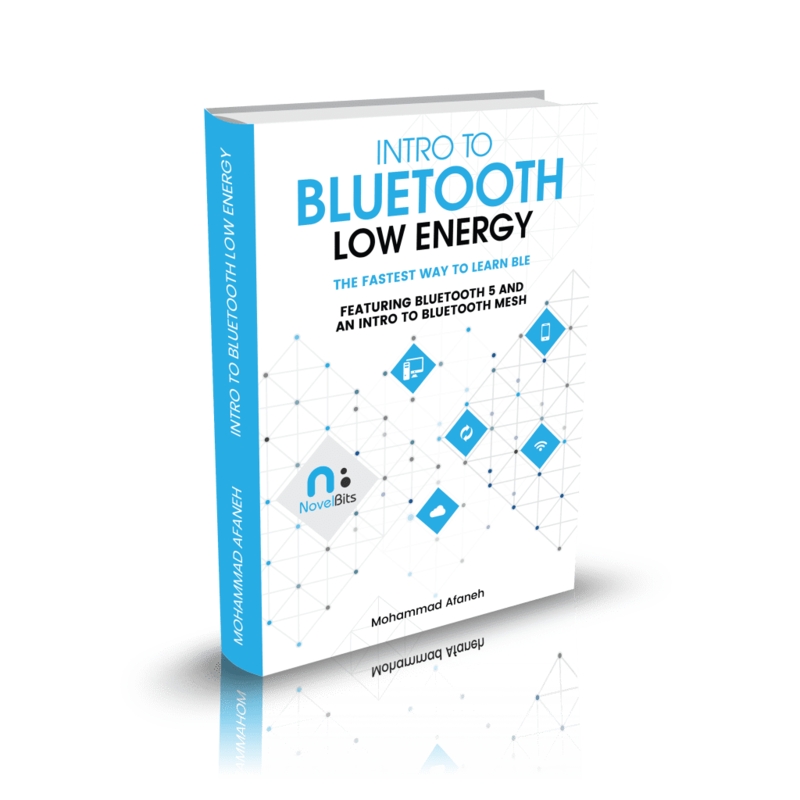 This 100-page e-book was designed to be the best possible introduction and most up-to-date guide for learning Bluetooth Low Energy technology. Do you find that every BLE resource out there skips the basics and jumps right into details? Learning a new technology is always a challenge, that also comes with a learning curve. Some technologies are easier to learn than others. Unfortunately, Bluetooth Low Energy (BLE) is one of those hard ones. The lack of good resources including blogs, tutorials, and up-to-date books that help a beginner to learn BLE makes the task even more difficult. Say you're assigned to a new project that involves the development of a connected IoT product. You have many options for connected technologies. You know that your product needs to send small amounts of data, consume very little power and connect to a smartphone. Then, you come across BLE and you find that it satisfies all of these requirements! But then, you end up spending days and weeks trying to better understand it. You read through many blogs, tutorials, and books but you find that they all dive right into details and concepts, diverting you away from learning the core concepts of BLE (which should've come first). Additionally, this meant that you had to start over the next day, wasting even more of your precious time. When you approach learning any technology, you need to start with the basics and work your way up to the more advanced topics. If the information is not laid out in the right way - in a way that pulls you in wanting to learn more - you may give up and lose interest in the subject. The end result is that you end up wasting your time, and finding yourself back at square one. This can be very frustrating! Sure, you can work your way through it and spend those late nights and countless hours putting together the pieces that make it all click in your head. The end result is definitely rewarding, but what if there was a much faster AND smoother ride to the finish line? Wouldn't you take that path instead? What are the most important basics and core concepts in BLE that I wish I had learned from the very beginning - the information that would've gotten me past the "break-in" period in the shortest time possible? The answer to this question lies in the collection of content and information that I've put together, in the following book. Want to check out a sample chapter first? Enter your email address below and I'll send you a sample chapter as well as the Table of Contents. Who am I? Why did I write this book? Hi! My name is Mohammad Afaneh, and I've been an embedded developer for over 10 years. Since 2014, I've focused solely on learning and developing Bluetooth Low Energy applications. You see, when I first started learning BLE, I spent hours, days, and weeks reading through every resource I could get my hands on! Too detailed, leaving me overwhelmed with all the jargon and nitty-gritty details that I didn't really care about as a beginner. Or, it was too short, leaving me with many unanswered questions. That's not to mention, that the last read-worthy book written on Bluetooth Low Energy was published or updated in 2015. That's 3 years ago - an eternity for a rapid-changing wireless technology standard such as BLE! I've even spent days and weeks going through the official 2,800+ page Bluetooth Specification document trying to find answers to the many questions I had. With this book in your hands, I'll be saving you from going down this painful path of learning BLE. Instead, you'll spend a few hours reading through this guide that will teach you the core concepts of BLE and Bluetooth 5 - only what you need to get started with this exciting wireless technology in the field of Internet of Things (IoT). Now includes PDF, Kindle (.mobi), and .ePub formats! If you're interested in a group order of the paperback at a discounted price, contact me at [email protected]. This book is for anyone looking to learn Bluetooth Low Energy (BLE): whether you're an embedded developer or mobile developer working on a companion BLE iOS app, or even a marketer or sales professional working for an IoT company. It is not for someone who is well experienced in Bluetooth Low Energy or looking for a practical guide for the embedded or mobile development of BLE applications. If you're an embedded developer looking for a very practical guide that can help you get off the ground running with developing BLE application, then check out my previously comprehensive e-book: Bluetooth 5 & Bluetooth Low Energy: A Developer's Guide. Hi! I'm Mohammad Afaneh, developer, founder of Novel Bits, and trainer in Bluetooth Low Energy (BLE) development. I teach everything I know about Bluetooth Low Energy development on my blog, through video tutorials, and at developer training sessions around the world. Have a question that I missed? I'd love to hear from you! Contact me HERE.